After just over a month in office, Donald Trump gave his first address to Congress. The content of Trump’s address was similar to past presidents’ State of the Union (SOTU) addresses with a focus on recent accomplishments and plans for the upcoming year. But what about the style of the speech? Unlike his inaugural address which was linguistically similar to Trump’s typical language, his recent address was more analytic and less authentic than normal. Similar to his RNC acceptance speech, Trump’s first SOTU was heavily shaped by a speechwriter. Although the content of the address overlapped considerably with Steve Bannon’s recurring themes of fear of outsiders, the linguistic markers were quite similar to the language of Stephen Miller in a recent interview on Face the Nation. Despite Miller’s probable role in the address, Trump’s latest speech is useful in understanding overall trends in the presidency and where Trump fits in. Similar to trends in inaugural addresses, SOTU speeches are generally highly analytic and formal, but have been becoming less so over time. Starting with Woodrow Wilson and Franklin Roosevelt, modern presidents have adopted a more informal, narrative style in their annual addresses to Congress. Trump’s first address continued this trend with his level of analytic thinking on par with the last 5 presidents. The decline in analytic thinking signals a shift in how presidents are thinking about problems and presenting their ideas. Trump, like other recent presidents, laid out his ideas in a simpler, more straightforward way than past presidents. Going forward, Trump will likely rely more and more on offering simple, intuitive solutions and ideas to the problems he faces. The language presidents use can show how confident and self-certain they are as leaders. Confidence or clout is indicated by more we-words and social words and fewer I-words, negations (e.g. no, not), and swear words. Whereas analytic thinking has decreased over the last century, clout has increased. Around the same time presidents began becoming less analytic, they also started to exude more confidence. Presidents have increasingly approached these addresses to Congress with confidence and certainty. Trump is the most confident so far, but is still similar to recent presidents. Trump and other modern presidents are decisive and confident in their plans and proposals. In their SOTU addresses, presidents have been becoming more confident and less analytic. These trends show that presidents are changing how they are thinking and interacting with lawmakers and the American people. Administration after administration, the yearly SOTU addresses are laying out simpler and less nuanced world views with bolder more decisive proposals. Faced with complex, hard-to-solve problems, clear and easy solutions are likely more appealing to present to an increasingly polarized Congress (and electorate). While Trump is often seen as a significant departure from presidential norms, in many ways, he isn’t all that different than other modern presidents. Rather than being an extreme outlier, Trump is part of long-term trends. He is a more confident, intuitive thinker, but Obama and Bush were as well. The content of what Trump is saying may be abnormal, but the style is typical of recent presidents. After one of the biggest scandals of the election season so far, Hillary Clinton and Donald Trump met in debate for the second time. While Clinton has seen substantial gains in the polls since the first debate, Trump has been steadily losing ground with many of his own party withdrawing support in the days after the latest scandal. Did these changes in the campaigns affect the candidate’s in last night’s debate? Here we examine how the tone of the candidates as well as their sense of status may have shifted. As with the first debate, both of the candidates launched attacks on their opponent. There were even questions addressing the negativity in the current election. Did the language in the last debate show any increasing negativity? The graph below shows how the candidates’ emotional tones have shifted from the primary debates to the first general election debate to the most recent debate. The language of both candidates in the primaries was relatively optimistic and upbeat. As they headed into first debate with Trump trailing in the polls, Clinton maintained that sense of optimism whereas Trump’s language took a pessimistic turn. In the latest debate, Trump fell further into negativity where Clinton retained her positivity. People who are high in clout speak confidently with a sense of certainty. They tend to use we-words and social words more while using I-words, negations (e.g. no, not), and swear words less. Historically, both Trump and Clinton have addressed their audiences with a relatively high degree of confidence. While they were still battling their primary opponents at the time, both were consistently in the top of the field lending a sense of power in their position. In the first Clinton-Trump debate, Clinton’s word usage suggested a greater sense of status or power whereas Trump’s language was more hesitating and weak. In last night’s second debate, the candidates’ language styles reversed. Despite his recent difficulties, Trump’s words revealed greater confidence that Clinton’s. With little time left before election day, the candidates are running out of time to gain votes. Given numerous difficulties, both are dealing with the fallout and managing voters’ perceptions. The ways in which their language has shifted suggest different reactions to their campaigns’ problems. Donald Trump is speaking with increasing certainty and confidence but, at the same time, revealing darker and more pessimistic tones. While Trump’s scandals have garnered more attention, Hillary Clinton is not without problems of her own. In contrast to Trump, she is maintaining an optimistic tone but speaking with less certainty. Linguistic features of candidates are very poor predictors of their electability. Sometimes we want a warm, approachable leader and other times we want a no-nonsense autocrat. Sometimes, we just want a change. Just paying attention to their words can tell us a great deal about their personalities but much less how effective they will be in governing a nation. The 2016 election cycle has baffled researchers across the political spectrum. Donald Trump is an aberration rarely seen at the highest levels of politics. Linguistically, he is authentic and supremely confident but at the same time simple and not concerned with logical or formal reasoning. There are times when we seek someone like this. If we are buying a new car and we know nothing about cars, the salesperson who comes across as authentic, confident, and doesn’t bog us down with details can be extremely appealing. And if the salesperson assures us, “trust me, I know more about cars than anyone”, how could we go wrong? Trump’s appeal gets at the heart of the human psyche. In an increasingly complex world, no one has an great understanding of the implications of major decisions. Every political, economic, or policy change has major unintended consequences that overwhelm some of the greatest minds of our generation. At some point, many of us simply turn to that confident new voice that promises a simple, straightforward solution that is guaranteed to work. The 2016 primary season has been a dream for many pundits and a nightmare for others. Despite the leads which made Trump and Clinton the obvious nominees, the race remains contested on both sides. Often below most people’s radar, John Kasich continues to remain in the race and, as we move closer to the conventions, promises to play an important role. While we have never examined Kasich in this blog, his resolve to stay in the race makes him worth a closer look. Kasich stands out from the other candidates in being highly oriented toward affiliation as shown in the graph below. In the debates, he frequently mentions friends and allies and reveals a strong commitment to social relationships. Whereas the other candidates are much higher in needs for power and status or achievement and success, Kasich cares about others on a deeply personal level. This is apparent in the high rates he makes references to friends, colleagues, and people he has met on the campaign trail. Similar to Donald Trump, Kasich is quite reward oriented. He is focused on the gains and benefits of his policies and on how things can go well and less concerned with risk and danger. More than any other frontrunner, Kasich speaks like a strong leader. Those high in clout speak confidently and tend to use more we-words and social words while using fewer I-words, negations, and swear words. Kasich’s language conveys certainty and interest in others; he is self-assured and secure in his own status. By the words he uses, Kasich is looking domestically not internationally. While Kasich is similar to the other candidates in his focus on the economy, he differs from them in his lack of focus on terrorism. Furthermore, Kasich’s frequently used words demonstrate his orientation toward affiliation (together, community, friends) and reward (grow, strong, great). Like Clinton, Kasich tries to drive home his qualifications (governor, ohio) and why he is the best candidates to improve the country. In the debates, Kasich pays attention to the policies and issues and less on the other candidates. When the other candidates attack, Kasich remains unperturbed refusing to talk about anything other than the issues. In an election dominated by big personalities, Kasich comes across as calm and relaxed, confident in his own abilities. If Kasich manages to make it to the White House, his need for affiliation may drive him to surround himself with friends and allies. He would likely spend his time focused on domestic issues and throw his energy into economic problems. His orientations toward risk and reward indicate that in pursuing these policies and problems, he may overlook potential risks and downsides in favor of looking at the potential gains and benefits. His low power orientation suggest Kasich is not concerned with the status of others or his place in the political hierarchy; Kasich feels secure in his position without having to compare himself to others. As president, Kasich is likely to be a self-assured leader with clear direction and a concern for others. 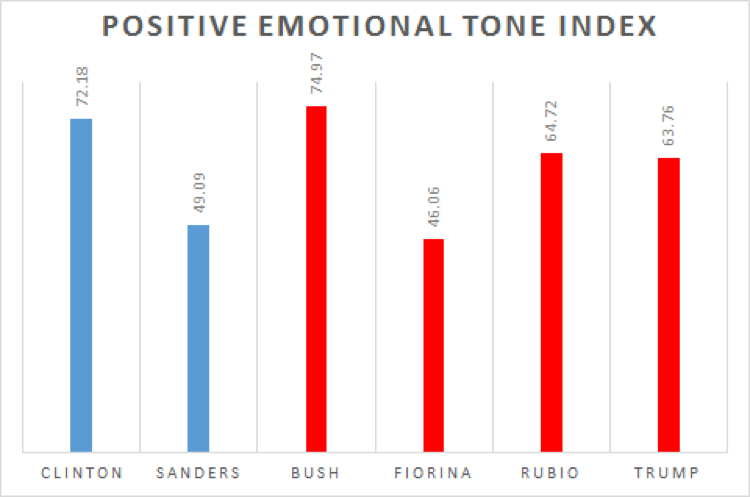 Clinton is much more positive in emotional tone than Sanders. Her levels of positivity are comparable to the most positive Republican, Jeb Bush. Sanders is somewhat more of an analytical, formal thinker than Clinton. All the candidates, however, are reasonably similar with the exception of Donald Trump — who appears incapable of thinking in a formal, logical way. Sanders and Clinton use language that comes across as authentic and honest in ways similar to Trump. 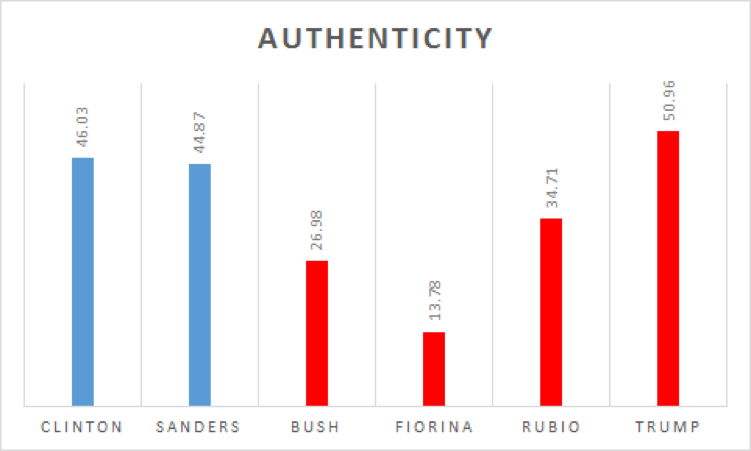 Fiorino, Bush, and Rubio are significantly lower than the others in authenticity. Sanders’ language suggests greater clout and more power-awareness than Clinton’s language. The male candidates across parties tend to use male-centric language at high rates with Sanders and Rubio being the most male-centric. For the female candidates, Clinton is balanced in her gender references while Fiorino uses slightly female-centric language. This is the first of several brief blog posts about the 2016 election. Our plan is to use some sophisticated computer-based text analysis methods to get a better sense of the social and psychological dimensions of the candidates. No platforms or positions discussed here. Just people’s basic thinking, emotional, and interpersonal styles. The basic system we rely on will be a computer program developed in our lab, Linguistic Inquiry and Word Count, or LIWC (pronounced “Luke”, and available for research purposes at www.liwc.net, or for commercial purposes through www.Receptiviti.com). LIWC analyzes any kind of text and calculates the percentage of words that are emotional, cognitive, and another 80 or so dimensions. There are now hundreds of studies in political science, business, psychology, and other disciplines that have used it. For a brief summary of articles, check this link or this one. The more recent version of the program, LIWC2015, has just been released and has a number of dimensions particularly well-suited to political campaigns. OK, let’s get serious. There are only two viable candidates for president in the Democratic race right now — Clinton and Sanders. O’Malley made a credible showing but until his ratings reach double digits, we’ll stick with the front runners. Biden may join the team eventually but let’s put him aside since he was a no-show for the October 13th debate. Although LIWC can analyze a mind-boggling number of dimensions, we will focus on only a handful: emotional tone, thinking style, authenticity, power and clout, and sexism (relative referencing of males to females). Historically, the American electorate has preferred more upbeat and optimistic candidates to more negative or hostile candidates. The simplest way to measure emotional tone is simply to calculate the total number of words that have a positive connotation (such as happy, success, good) or a negative one (anger, death, hurt). Across the board, Clinton was far more optimistic and upbeat than Sanders. It’s also interesting to compare the emotional states of Clinton and Sanders to the most likely candidates on the Republican side — Bush, Rubio, Fiorina, and Trump (sorry to those of you who are rooting for Cruz or Ben Carson or one of the others — it’s not gonna happen). As you can see in the graph, Clinton’s emotional state is similar to Jeb Bush, Rubio, and Trump. Sanders and Fiorina are both impressively low. Note that the Emotional tone index is a weighted score that ranges between 0 (very negative) and 100 (very positive). The words people use in everyday language can reveal their natural thinking style. There are at least two ways to capture thinking styles that are related to the debates. The first measures people’s natural ways of trying to understand, analyze, and organize complex events. We have devised a metric called the categorical-dynamic index, or the CDI. A high score on the CDI is associated with analytical, formal, and logical thinking. A low score is often associated with more narrative thinking where the speaker is in the here-and-now. The CDI has been found to be related to college grades, measures of intelligence, and various markers of academic success. The second measure, which we call Cognitive Processing, reflects the extent that people are trying to work out a problem in their minds. For example, if you were asked to describe the most efficient way to get from your home to the City Hall in a particular town about 100 miles away, you would likely use words such as think, believe, realize, know, and other cognitive processing words. However, if you knew precisely how to get there because you had driven that route dozens of times, you would not use cognitive processing words. In other words, if you are still trying to figure out a problem, you use cognitive processing terms; if you are certain that you know “the answer”, you don’t use these words. In terms of raw intelligence and the ability to think analytically, Sanders scores slightly higher than Clinton. In fact, most of the likely Republican nominees are in the same range. The one who scores far, far below the rest is Donald Trump. Trump shoots from the hip and is guided by his intuition. He is not a logical or analytical thinker. 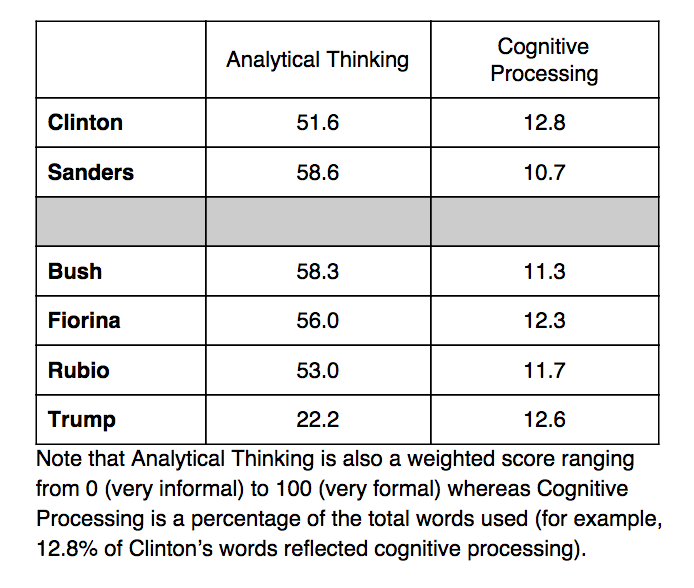 Of all the candidates, Hillary Clinton scores highest on cognitive processing — meaning she is someone who continues to work through issues as they come up. Bernie Sanders, however, is the lowest of all the candidates. This suggests that he has already thought through his positions and is most entrenched in his beliefs in that he is no longer thinking about them as much as the others. Over the years, multiple labs have developed algorithms that tap the degree to which people are personal, honest, and authentic. The authenticity measure is made up of words such as I-words (I, me, my), present tense verbs, and other dimensions previously associated with telling the truth. While the Democrats are quite similar to each other in terms of authenticity, they are strikingly higher than the Republican candidates with the exception Trump. There are at least two ways to think about power, status, and clout. The first, which we call clout, is the kind of power that is seen in a strong leader. A person with clout speaks with confidence and a sense of certainty. People who have clout tend to use we- and social words more and I-words, negations, and swear words less. Overall, Sanders uses language that suggests more clout than Clinton. Although Fiorina was far higher than Sanders in the last Republican debate and Trump was somewhat lower than Clinton. The ways people use words tell us where they are paying attention. If a speaker uses a high rate of words such as women, females, she and her, and relatively few references to males, the speaker is simply thinking and talking about women more. Is this sexist language? Maybe, maybe not. Does this speaker always make more references to women than men? If so, the person certainly isn’t paying much attention to people of the male persuasion. By analysing references to females and males, we can get a sense of candidates’ natural orientations to women and men. We aren’t warranting that this is a measure of overt sexism but it may be a subtle or implicit signal of gender bias. Check out the graph. The numbers refer to the percentage of all gender references that are male. Numbers above 50% suggest a male bias; numbers below 50% hint at a female bias. Overall, Hillary Clinton and Carly Fiorina use gendered language very differently than the male candidates. Clinton referred to males and females at similar levels; Fiorina made more references to women than men — partly based on the questions she was asked in the last debate. The men, however, were far more gendered in their language than the women. It wasn’t even close. The two who were most male-centric were Sanders and Rubio. This is the first of several posts about the 2016 election. The current analyses are relatively cursory but give an interesting perspective on the most likely nominees for the Democratic and Republican parties. For more information about the current project contact Kayla Jordan or James Pennebaker. More information is available about the basic research behind LIWC and commercial uses.